My son LOVES activity books. I LOVE that he is learning and playing at the same time. I was super excited to show him The Berenstain Bears Bear Country Fun Sticker and Activity Book. As soon as I showed him, he wanted to get started. It is recommended for ages 4-8 and I think that is pretty accurate. He is 5 and a beginning reader and can do many of the activities but some we will revisit (like crossword puzzles). The Berenstain Bears come to life with this sticker and activity book fans are sure to love! 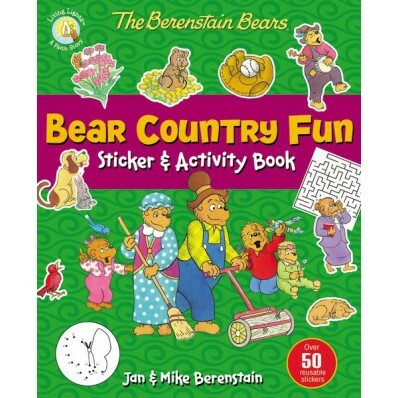 In The Berenstain Bears Bear Country Fun Sticker and Activity Book join the whole Bear family through fun puzzles, mazes, coloring pages, and 50 reusable stickers. The pictures are brightly colored and very engaging. A sample of the activities included. My little man "hard at work" and having a blast! One lucky reader will win a copy of The Berenstain Bears Bear Country Fun Sticker and Activity Book! My favorite Berenstain Bear is mama bear. My favorite is brother bear! He is always so full of adventure!! my favorite is papa bear he is always full of knowledge and always has the greatest patience with his kids..